Farmers are a curious bunch, naturally drawn to new information and capable of solving their own problems. You see, problem solving is necessary if farmers are to keep on track with timely work. Ultimately, they save the cost of hiring someone and save time too. They find ways around problems or invent new and novel solutions to them. They do not give up easily and often have more than one plan for the day and more than one solution at the ready. 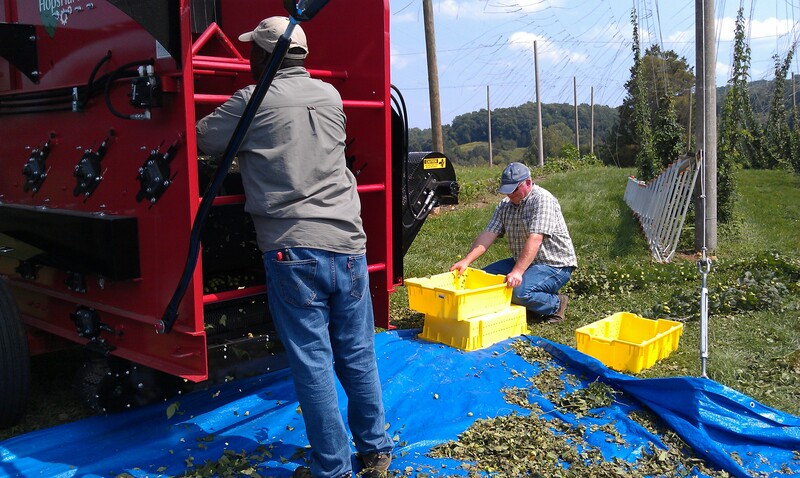 Hops variety trial harvest, Sept 5, 2017, pictured left to right Dr Laban Rhutto, VSU specialist, operating his hops “combine”, Brad Jarvis, Extension Agent, Madison, not pictured Extension Agent Carl Stafford, Culpeper and Bald Top Brewing staff, Caleb Highly. Thank you to Bald Top Brewing, Madison County for hosting this trial, also supported by Rappahannock Electric Coop, Dominion Resources, GWC Regional High School Alumni Assoc., Spruce Rock Farm, Madison Young Farmers, Rosenberger Farms, Copper Hill, Bordeaux Farms, Red Crest Farms and the George Washington Carver Agriculture Research Center. The best get ahead of trouble through preventative maintenance, early action on planting and harvest and early adoption of new methods. While this makes many of them leaders, there are also a large group in the middle looking for good ideas. This makes them sharp about recognizing the good ideas of others and willing adopters when beneficial ideas are found. Just the other day I was using an unusual distance-measuring device. A wind up cable capable of measuring football field length. Not often seen in use, it drew the attention of the young men I was helping. Their interest in and curiosity about this tool made me think of these important traits. Thankfully, these traits still exist in our next generation of farmers. Maybe the business draws this type of personality or at least quickly culls those who do not master its importance. Many farm magazines have a page describing inventions and plenty of these good ideas are in place on local farms. A special gate latch copied from a farmer who loves to make modifications improving the function and ease of operation on his farm near Reva. Time saving, labor saving, safety improving inventions are all around us. A farm north of town is in the finishing phase of improvement, where the new owner shows remarkable and functional ideas at work. Cantilever overhangs on buildings protecting poles from likely damage when set out on front corners. Water catchments and piping systems made from recycled materials, a back gate not easily breached, decorated for looks and security. Interior roads connecting the property within itself, making easy access in all weather. Equipment inventions are less common, but often seen are equipment modifications. Adding a hydraulic cylinder eases the burden of lifting; attaching a hitch pin rope allows the operator to remain seated, and a sliding wagon tongue makes connections simple, a rear view mirror soothes the strained neck while keeping an eye on what is following. However, inventions are the real story. Making a machine do twice the work is a great advancement – many do this. Anytime farmers can replace labor with equipment, they often do. You see the equipment shows up every day, has no complaints, is never sick (almost never), works in cold and hot, dusty conditions, forgives operator error and has few paperwork needs. Equipment inventions are simply once you understand how they work. The few capable of these inventions make the rest of us their beneficiaries, as we adopt what we see working, it becomes possible then. Our rate of adoption is increasing as the benefits of new and proven inventions take less time to be realized by each generation.